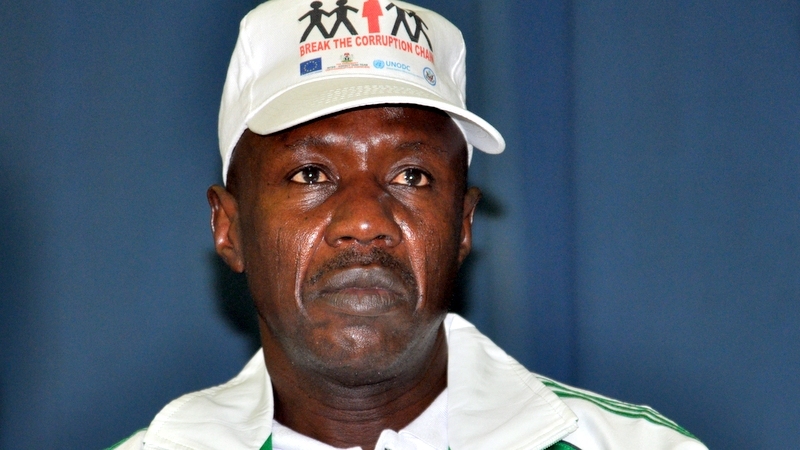 Chairman of the Economic and Financial Crimes Commission (EFCC), Ibrahim Magu, has disclosed that the agency was indeed probing and collating evidence against former president, Goodluck Jonathan and other accomplices in the arms purchase scandal. He stated this when he visited the office of the BBC Hausa service in London at the weekend. Asked when Jonathan would be asked to appear at the EFCC, Magu said: “Anybody that is involved in this scandal, we will invite him. It is only that we have to first establish our evidence. “Anybody who is guilty, I swear, we will summon him wherever he is. Anybody that we invited, we must have finished with our background study on him. “We spend not just days for the background work but months until we establish the case before we issue invitation. That is why none of the people we invited has come out clean. Questioned on amount recovered by the EFCC under him, Magu responded: “Because of what is going on, I can’t tell you the exact amount we have recovered so far. But we are still collecting the monies. “I can’t tell you for now, but what we have recovered within this period alone, was never recorded since the establishment of the EFCC in 2003,” he said. “Actually, what we recovered is way beyond that figure. I don’t want to let it out now. On 29th May, we will disclose every detail and Nigerians will know what we have done”, he added.